A growing fleet of satellites is monitoring man-made greenhouse gas emissions from space, spurred by the need to track down major sources of climate changing gases such as methane and carbon dioxide. While scientists and policy-makers agree that getting a firm grasp on the origins of emissions is key to tackling global warming, there is great political sensitivity surrounding the issue. In 2009, President Barack Obama suggested during the U.N. climate talks in Copenhagen that the United States might use satellites to monitor other countries' emissions. Obama's call for sharing such information "so that people can see who's serious and who's not" annoyed China and other countries worried about outside monitoring of their emission figures. Experts say precise country-specific emissions accounting from space remains a long way off. So-called emissions inventories are key to implementing the 2015 Paris climate accord, but until now there's been no international standard for them, let alone independent oversight. Each country reports data, often years-old estimates, which are used to determine whether they're doing enough to cut emissions. According to a recent report by the Intergovernmental Panel on Climate Change, emissions of the most abundant greenhouse gas, carbon dioxide, would need to be reduced to a level the planet can absorb—known as net zero—by 2050 to keep global warming at 1.5 degrees Celsius (2.7 Fahrenheit), as envisaged in the Paris agreement. Space-based observations allow scientists to capture the big picture, Tarasova said. But, she added, "It's like a Russian doll. You start from the global observation, then you go down to regional observation and to local observation." The effort to inventory the world's greenhouse gas emissions has taken on an added urgency amid concerns that some gases may not yet be apparent. Greet Maenhout, a scientist at the European Commission's Joint Research Center in Ispra, Italy, said it was only recently discovered that coal mines leak carbon dioxide. "This has been seen from space by flying over it," said Maenhout. 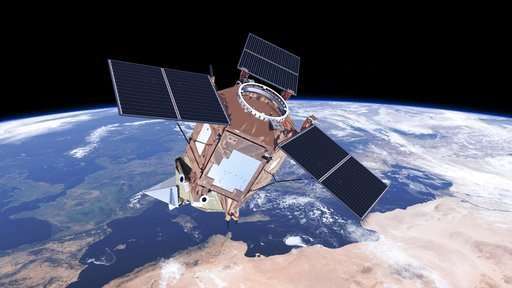 The Commission has funded several satellites to monitor whether European Union member states are meeting their commitment to reduce greenhouse gases by 2030 by 40 percent compared to 1990 levels. 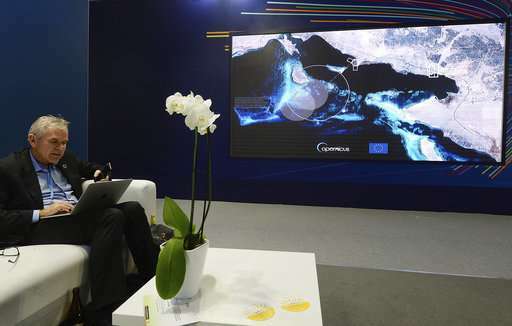 While satellites on their own can't provide accurate emissions figures from afar, their advantage lies in their consistency, said Claus Zehner, manager of the European Space Agency's Sentinel-5P mission. 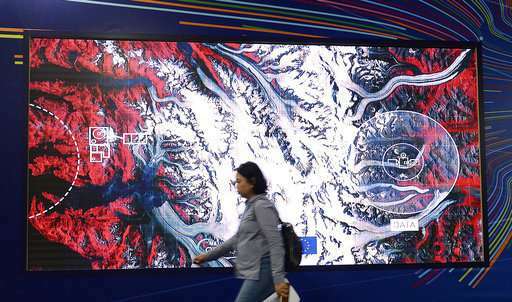 "You can easily compare different measurements, different emissions for different countries, which is not easily done with ground-based measurements," he said. Observations have shown a decline in sulfur dioxide emissions over China over the past decade, compared with an increase over India, indicating that Beijing is acting to reduce pollution, said Zehner. Such results, combined with the fact that new instruments are able to collect data with increasingly fine resolutions, are bound to worry governments wary of having others peer into their territory. 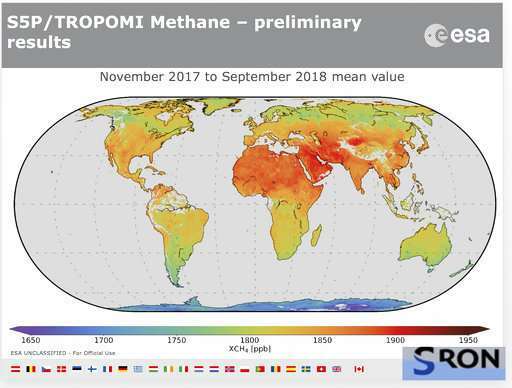 Previously unpublished measurements of methane captured by Sentinel-5P and its predecessor Sciamachy show a worldwide increase in atmospheric levels of this potent greenhouse gas, particularly in industrialized countries and emerging economies. In the coming years, a flurry of new gas-detecting instruments will be heading into orbit. A copy of NASA's OCO-2 will be attached to the International Space Station next year, and a stand-alone system, Geocarb, is scheduled for launch into a higher orbit in 2020. Ultimately, scientists argue that since space-based measurements are on the rise, it makes sense to share the data and work together. "We want to have the big players like China and USA all on board with these measurements so that they even would contribute within an international framework," said Maenhout, who has worked on emissions inventories for over a decade.